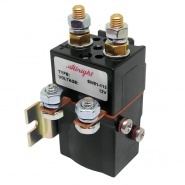 Albright International single pole solenoids with double throw main contacts, the SPDT contactors have silver alloy tips, which are weld resistant, hard wearing and have excellent conductivity. Used for switching small to large traction motors (depending on version), hydraulic power packs and electric winch motors. All versions are available for Scheduled Maintenance or Production Run lead-time ordering. SW61-115 12V sealed miniature single pole double throw solenoid contactor. 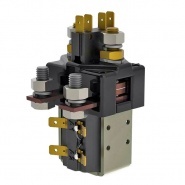 SW61 contactors designed for compact DC application. SW84-3 single pole solenoid contactor 12V intermittent. 100A single pole, double throw 12 volt solenoid. SW84A-14 single pole solenoid contactor 12V intermittent. 100A single pole, double throw 12 volt solenoid. SW84-2 single pole solenoid contactor 12V continuous. 100A single pole, double throw 12 volt solenoid. SW84-1 single pole solenoid contactor 24V intermittent. 100A single pole, double throw 24 volt solenoid. SW84-213 single pole solenoid contactor 24V intermittent. 100A single pole, double throw 24 volt solenoid. 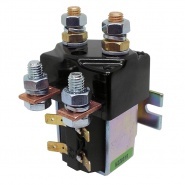 SW84-4 single pole solenoid contactor 24V continuous. 100A single pole, double throw 24 volt solenoid. SW84-94 single pole solenoid contactor 24V continuous. 100A single pole, double throw 24 volt solenoid. SW84-7 single pole solenoid contactor 48V intermittent. 100A single pole, double throw 48 volt solenoid. SW84-8 single pole solenoid contactor 48V continuous. 100A single pole, double throw 48 volt solenoid. SW181-1 single pole 12V dc contactor. 150A single pole, double throw (SPDT) 12 volt solenoid. SW181B-1 single pole 12V dc contactor with magnetic blowouts. 150A single pole, double throw (SPDT) 12 volt solenoid. SW181-2 single pole 12V dc contactor. 150A single pole, double throw (SPDT) 12 volt solenoid. SW181B-2 single pole 12V dc contactor with magnetic blowouts. 150A single pole, double throw (SPDT) 12 volt solenoid. SW181-3 single pole 24V dc contactor. 150A single pole, double throw (SPDT) 24 volt solenoid. SW181B-3 single pole 24V dc contactor with magnetic blowouts. 150A single pole, double throw (SPDT) 24 volt solenoid. SW181-4 single pole 24V dc contactor. 150A single pole, double throw (SPDT) 24 volt solenoid. SW181B-4 single pole 24V dc contactor with magnetic blowouts. 150A single pole, double throw (SPDT) 24 volt solenoid. SW181-7 single pole 48V dc contactor. 150A single pole, double throw (SPDT) 48 volt solenoid. SW181B-7 single pole 48V dc contactor with magnetic blowouts. 150A single pole, double throw (SPDT) 48 volt solenoid. SW181-8 single pole 48V dc contactor. 150A single pole, double throw (SPDT) 48 volt solenoid. SW181B-8 single pole 48V dc contactor with magnetic blowouts. 150A single pole, double throw (SPDT) 48 volt solenoid. SW181-15 single pole 72-80V dc contactor. 150A single pole, double throw (SPDT) 72 to 80 volt solenoid.